In June 2018, in part due to congressional concerns, the Army announced a new modernization strategy and designated the Next Generation Combat Vehicle (NGCV) as the program to replace the M-2 Bradley. In October 2018, Army leadership decided to redesignate the NGCV as the Optionally Manned Fighting Vehicle (OMFV) and to add additional vehicle programs to what would be called the NGCV Program. The M-2 Bradley, which has been in service since 1981, is an Infantry Fighting Vehicle (IFV) used to transport infantry on the battlefield and provide fire support to dismounted troops and suppress or destroy enemy fighting vehicles. Updated numerous times since its introduction, the M-2 Bradley is widely considered to have reached the technological limits of its capacity to accommodate new electronics, armor, and defense systems. Two past efforts to replace the M-2 Bradley—the Future Combat System (FCS) Program and the Ground Combat Vehicle (GCV) Program—were cancelled for programmatic and cost-associated reasons. In late 2018, the Army established Army Futures Command (AFC), intended to establish unity of command and effort while consolidating the Army’s modernization process under one roof. AFC is intended to play a significant role in OMFV development and acquisition. Hoping to field the OMFV in FY2026, the Army plans to employ Section 804 Middle Tier Acquisition Authority for rapid prototyping. The Army plans to develop, in parallel, three complementary classes of Robotic Combat Vehicles (RCVs) intended to accompany the OMFV into combat both to protect the OMFV and provide additional fire support. For RCVs to be successfully developed, problems with autonomous ground navigation will need to be resolved and artificial intelligence must evolve to permit the RCVs to function as intended. The Army has stated that a new congressionally-granted acquisition authority—referred to as Section 804 authority—might also be used in RCV development. 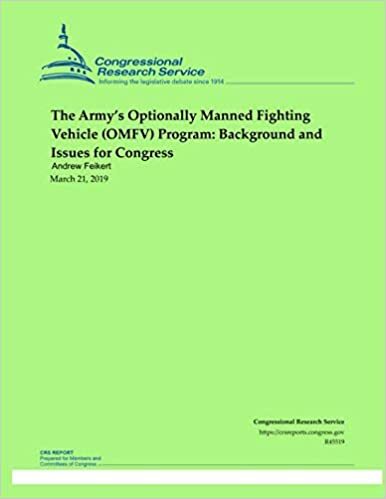 The Army requested $378 million in Research, Development, Test, and Evaluation (RDT&E) funding for the OMFV program and $109 million in RDT&E funding for the RCV in its FY2020 budget request.